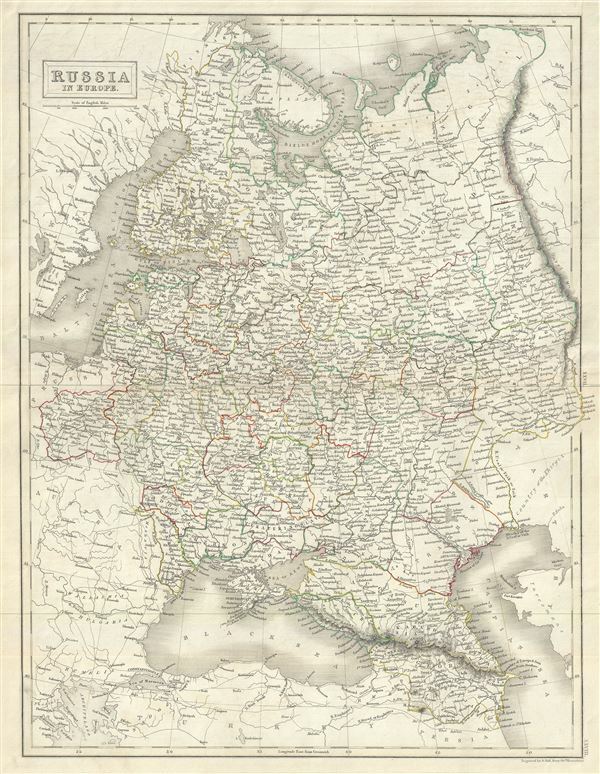 This is a fine example of Adam and Charles Black's 1844 map of European Russia. It depicts the European portions of Russia from the Arctic Sea south to the Black Sea and Caspian Sea, and extending west as far as Poland and east as far as Orenburg and Perm, inclusive of the Ukraine. Various towns, rivers, cities, mountains and several other topographical details are noted with relief shown by hachure. When this map was printed, Russia was ruled by Tsar Nicholas I who adopted the doctrine of 'Orthodoxy, Autocracy, and Nationality' and was known to be one of the most reactionary monarchs in Russia. In 1825, Russian army officers, called the Decembrists, protested against Nicholas I's ascension to the throne. The Decembrists, so named because their revolt started in December, favored Nicholas I's brother, Constantine, who seemed amenable to a British style constitutional monarchy. When Constantine abdicated the throne in 1825, the Decembrists refused to accept the more autocratic rule of Nicholas I. Had Constantine not abdicated and the Decembrists been successful, the bloody Bolshevik Revolution may never have occurred. This map was engraved by Sidney Hall and issued as plate nos. XXVII and XXVIII in the 1844 edition of Black's General Atlas. Very good. Original platemark visible. Blank on verso. Minor wear along original centerfold. Rumsey 2305.034 (1854 edition). Philips (atlases) 4334.